Everyone seems to be installing solar panels on their roof these days. New data shows a solar hot water and space heating system is a better option than a solar electric system (PV) to save you money. Documents from the Solar Rating and Certification Corporation, a non-profit organization that rates solar system efficiency, recently rated the difference between the two systems. 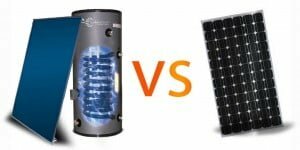 Certain factors settle the dispute: heating your water and your home using solar, wins by a landslide compared to a PV system. 1) System Cost: SunMaxx Solar, a leading solar thermal company, says the typical 4-person home will need an 80 gallon tank and 2 collectors. SunMaxx sells this system for $4,000 to $8,000. An installed PV system for a 4-person home costs between $16,000 and $20,000. 2) Efficiency: A PV system is between 15-18% efficient. Solar hot water panels are between 70-90% efficient. 3) KWh Production: According to the SRCC, the SHW installation in our Richmond VA home will produce about 3,100 kWh per year. The home’s PV system will only produce 2,453 kWh in one year. 4) Payback: According to the SRCC, in order to generate 1 kWh, if you install PV system, it costs $3.86. For solar thermal, it’s only 0.86 cents. Basically, it’s a quarter of the cost to generate 1 kWh. SunMaxx Solar CEO Adam Farrell, understands the downside to solar thermal because today, “PV has distribution channels and financing programs which has significantly reduced the cost and installation of a system…Solar thermal is still new, and distributing product through inefficient channels, thus increasing the system cost.” That being said, imagine the economic benefits in the future. In the meantime, solar thermal systems are still 8x more efficient, cheaper to install for kWh, and also have better state rebates. In the end, solar thermal is destined for a “bright” future.